The first five paragraphs are from an article in the New York Times about the recent discovery of 10 privately held 1933 Gold Double Eagles. The subsequent paragraphs are the contents of a press release I just received from the Professional Numismatists Guild (PNG) regarding this matter. The United States Mint announced yesterday that it had recovered 10 more of its fabled 1933 double eagle $20 gold pieces and stored them in Fort Knox. But the family that sought to authenticate them at the Mint claims that the government had no right to take them. Beth Deisher, the editor of Coin World, said that “it has been rumored for years that more of these coins were being held by private citizens.” The Mint’s announcement on its Web site caused a sensation in coin circles yesterday. A 1933 double eagle that surfaced in 1996 is on exhibition at the Federal Reserve Bank of New York, at 33 Liberty Street in Manhattan. The Treasury declared it a coin as part of a legal settlement, and in 2002 it was sold at Sotheby’s for $7.59 million - the most ever publicly paid for a coin.The anonymous buyer has lent it for display. The Mint said that the Treasury would not declare them legal coins, or auction them. They came to light last September when, the Mint said, the government was approached by a lawyer for the family of a Philadelphia jeweler. 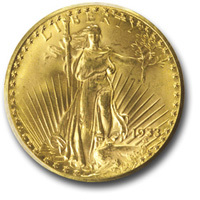 (Fallbrook, California) – The legal counsel for the Professional Numismatists Guild (www.PNGdealers.com), a nonprofit organization composed of the many of the country’s top rare coin dealers, warns that the latest government confiscation of ten 1933 Double Eagles could lead to “dire consequences” for collectors who own other historically important numismatic items. “Throughout its history, the U.S. has manufactured literally thousands of special or unusual coins which from a numismatic standpoint are rarities and, in some cases, one-of-a-kind items. Unauthorized coins have historically been freely and openly collected and sold without any intervention by the Government. Indeed, many of these coins are the most valued coins sold at auctions and privately today,” said PNG attorney Armen R. Vartian. In February 2000, PNG filed a 14-page “friend-of-the-court” (amicus curiae) legal brief with the United States District Court for the Southern District of New York on behalf of London, England dealer, Stephen Fenton, whose 1933 Saint-Gaudens Double Eagle was confiscated in 1996. Eventually, the case was settled prior to trial, and the coin was sold at auction in July 2002 for $7.59 million with Fenton and the U.S. government sharing the proceeds.